Arthur William Thoms was born August 28, 1947 in Teaneck. Art’s family moved around the state when he was growing up, from Bergen County to Passaic County to Ocean County. A burly teenager with good speed, Art began playing organized football when he joined the freshman team at Wayne Valley High School. He came into his own as a player for Brick Township High School after a move south, and finally at Hargrave Military Academy, a prep school in Virginia, in 1964. Art was recruited by several schools as a defensive lineman. He chose Syracuse and enjoyed a standout career for the Orangemen under coach Ben Scwartzwalder. The stars of the team were running backs Larry Csonka and Tom Coughlin. The Orangemen were a Top 20 team in Art’s sophomore season, and they played in the Gator Bowl. They had less success in 1967 and 1968, but still had winning records. In 1969, the Oakland Raiders selected Art with the 22nd pick in the draft. He was just the sixth Syracuse player ever taken the first round at the time. 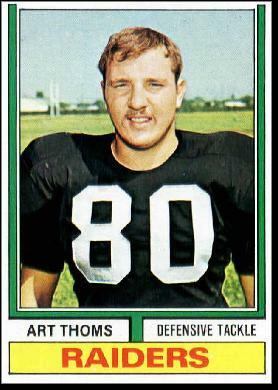 Art cracked the starting lineup in 1970 as a defensive tackle, but suffered an injury and missed half the season. From 1971 to 1975, he was a mainstay on the vaunted Raider defense, primarily at left tackle. He was named First-Team All-AFC in 1974. Injured prior to the start of the 1976 season, Art missed the entire year—including Oakland’s Super Bowl win. After failing to make the team in 1977, he attempted a comeback closer to home, with the Eagles, but retired after one year as a bench player. Art returned to Northern California after his playing days. He stayed busy with personal appearances and autograph signings, and invested in a chain of popular Raiders memorabilia and souvenir shops started by teammate John Vella.